I don’t think I’ll ever get used to this working remotely thing. The fact that I can take almost my entire job with me in one ridiculously handy backpack was something I would have never imagined possible a few years ago. Hell, even one year ago. 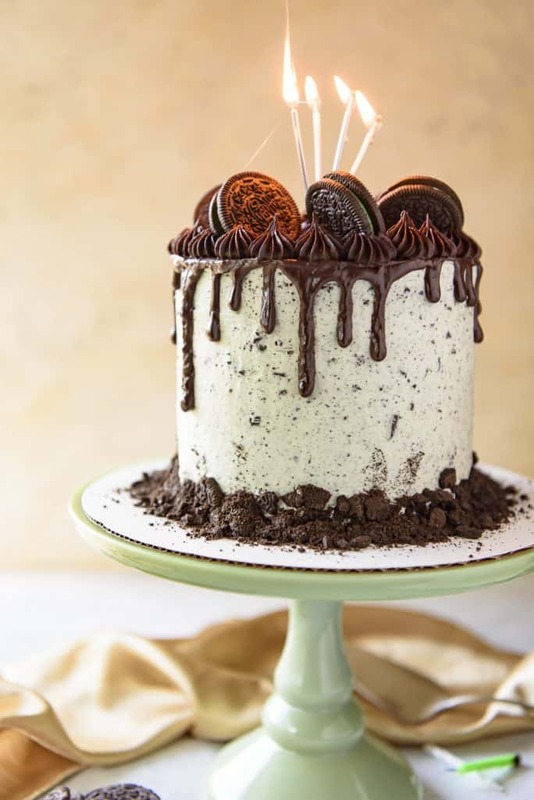 This calls for cake – and I’m thinking it should be cookies & cream cake! 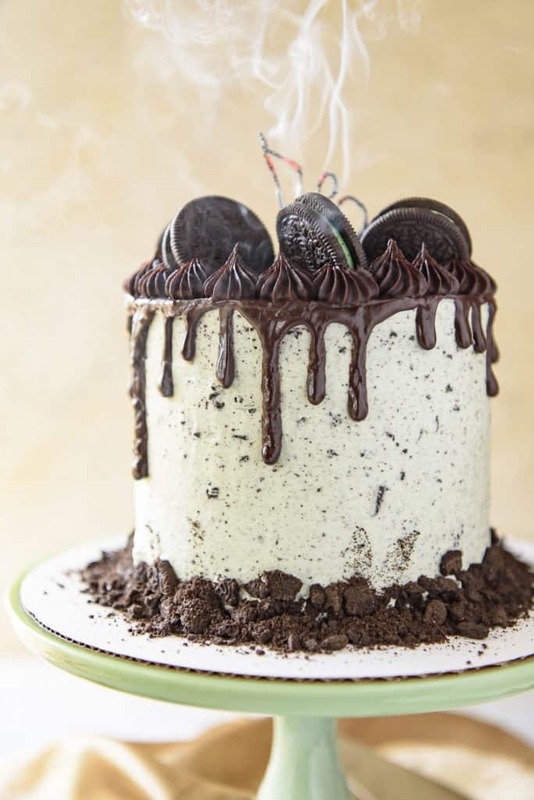 Mint Cookies and Cream Cake! I’ve noticed in the last year or so that my taste for sweets has changed considerably. A few years ago, I would have thrown together some over-the-top concoction or cake, icing, chocolate, and probably ice cream or something. Lately, sweet things are only tolerable in small doses – meaning no more full pints of ice cream, large milkshakes, double servings of fudge brownies. My waistline will hopefully thank me for it. I know my blood sugar does. In comparison, this year’s birthday cake is pretty subtle. I’d almost call it grown up. 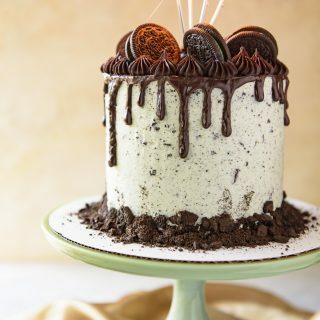 How do you make Oreo cookie cake? Deep dark chocolate cake. 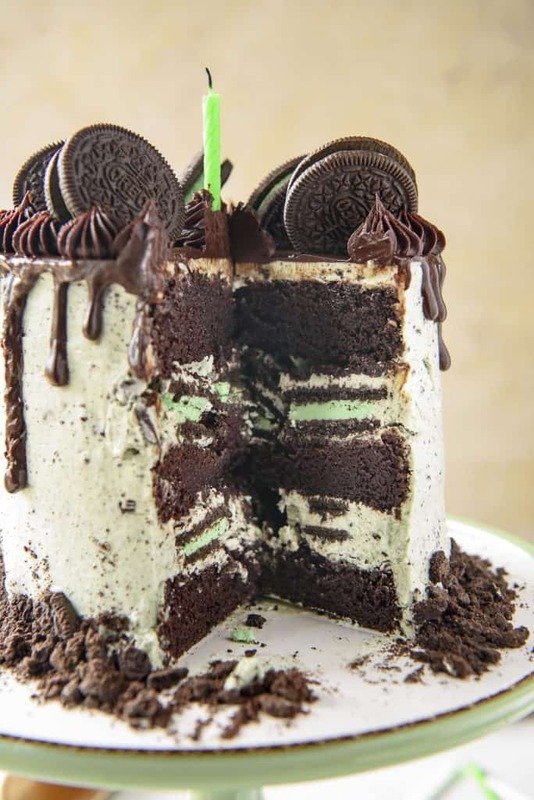 Mint buttercream, light on the powdered sugar and mildly sweetened using the filling from my favorite Oreos. Rich chocolate ganache, poured, drizzled and piped. More Oreos. A whole package, actually. 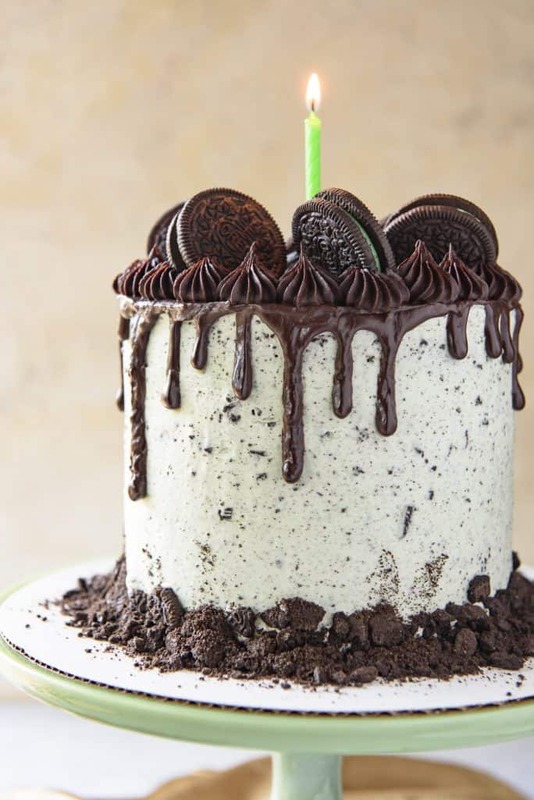 I generally don’t name my recipes after branded ingredients, but this is purely an Oreo cookie cake. OK, so maybe the hidden Oreos inside are a little crazy – and they’re totally optional if they’re too much for you. But since this is my birthday cake, it sounded like a fun addition. I do love how the cookies and cream buttercream softened them after a day of sitting under a cake dome on the counter. Everyone knows Oreos are best when dunked in milk to the point of sogginess, right? Well, this clever layering saves you that step. Winning move, in my opinion. Bite and sip instead. 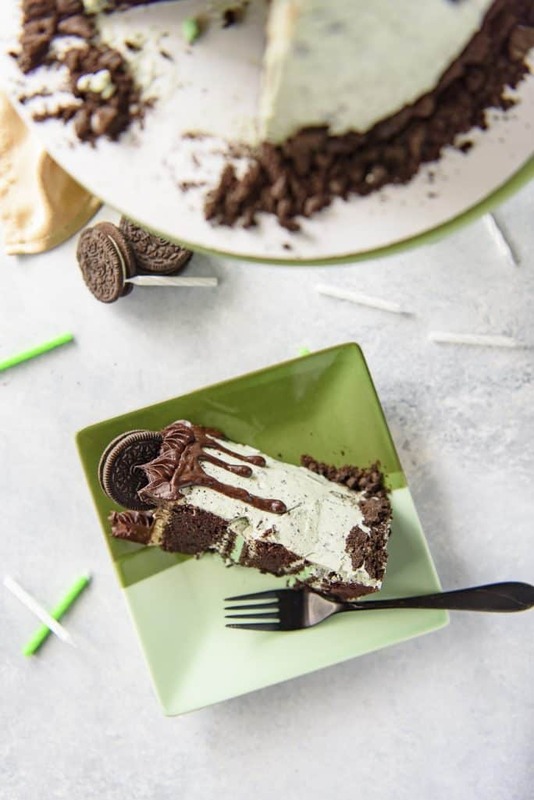 Not a mint Oreo fan? 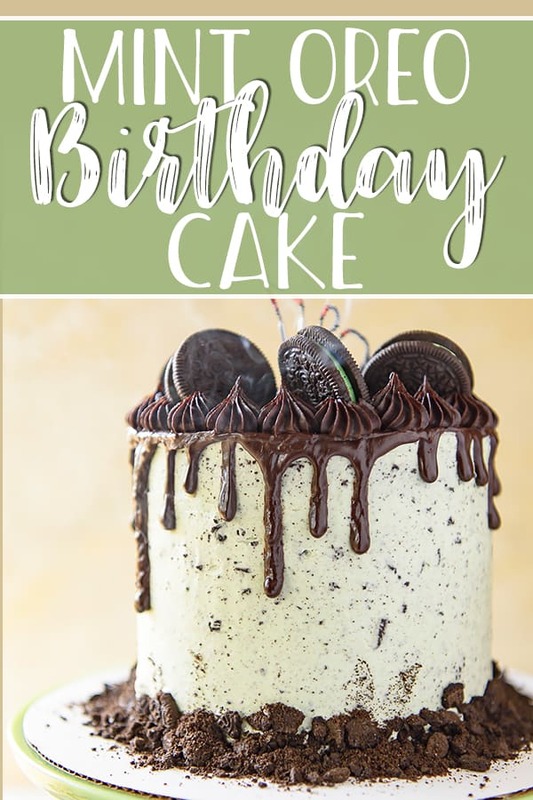 One of these other tasty birthday cakes will work for you! Cover the top of the cake in warm chocolate ganache, then allow it to drip down the sides, helping it along with a spoon or offset spatula. 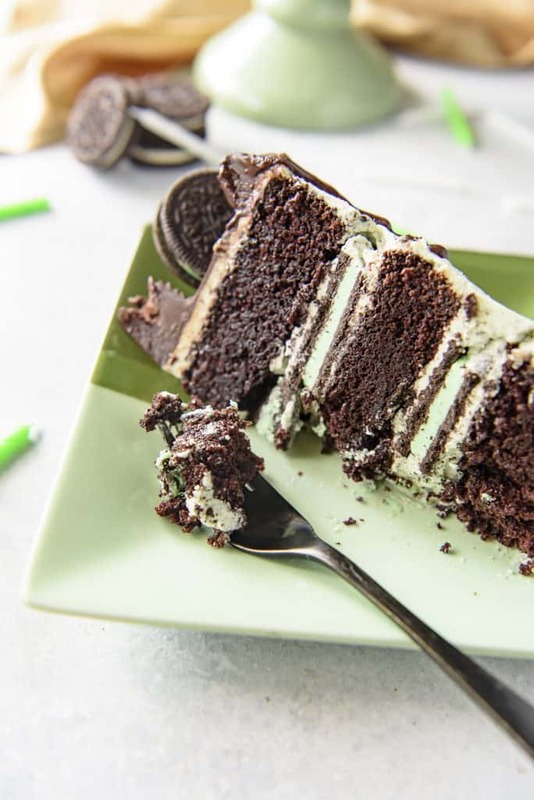 PIN THIS MINT OREO CAKE RECIPE FOR LATER! Oh my goodness!!! This looks incredible!!! Will and I joined a Dietbet this month so no sweets for me until March 15th, but I want to faceplant in this ASAP. 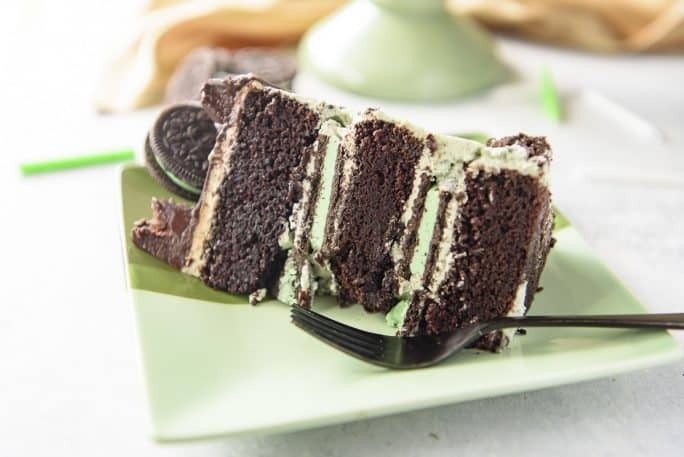 Oreo mint anything is my favorite!! !